A Biblical defense of the Reformation principle of sola Scriptura, Volume 1 of 3. By David T. King. One of the foundational principles of the Reformation was the perspicuity, primacy and sufficiency of Scripture. Historically, Roman Catholic apologists and theologians have maintained that sola Scriptura is illegitimate, because, as they claim, it is not taught in Scripture. 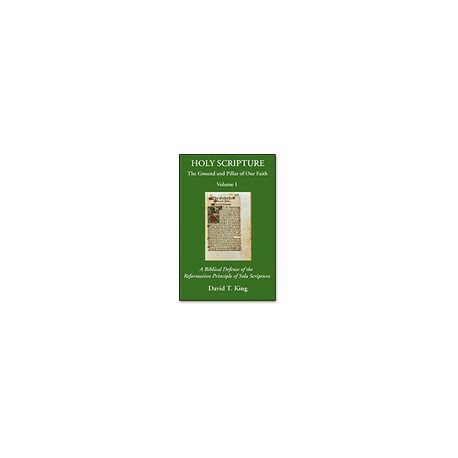 In this Volume, David King provides a biblical defense of sola Scriptura . He sets forth the positive teaching of Scripture regarding itself, convincingly demonstrating that Scripture teaches its own sufficiency as God's revelation, and possessing the innate ability to communicate clearly and understandably the necessary truths for faith and morals for every Christian. He systematically addresses and answers the Roman Catholic arguments against sola Scriptura .